As the school year is closing, some may be thinking about how to show their appreciation for teachers and other school support personnel. We know many teachers who have found great value in personal messages created for them by their students and parents. Letters, photo albums, and other documentation of what made the school year important to them usually stand far above token gifts of items such as candy and coffee cups. To see that a student or parent has taken the time to articulate WHAT has made the teacher relationship special, well, that carries its own special message. One of my most prized possessions is a clay cup. It is molded in the shape of my face by one of my former students. Liz made it for me in art class when she was a fifth grader about 34 years ago. 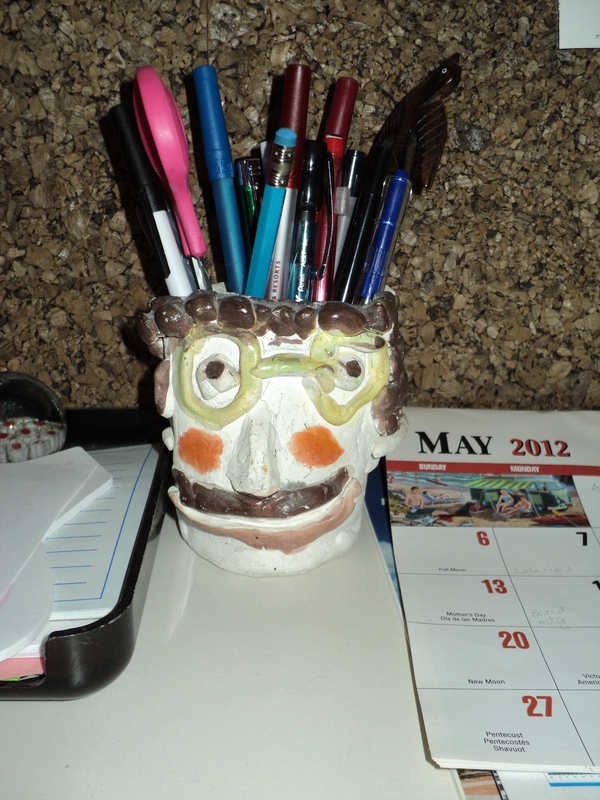 It sits on a counter in my kitchen holding pens and pencils. I look at it every day. It serves as a reminder of a memorable student as well as a symbol of the feelings I’ve had for all of my students. Students and parents: think about creating a representation of your fond feelings for your teacher and consider beginning it now. By the time the year has ended, you will have a gift for the teacher that will resonate with him or her for a lifetime. Teachers and other school personnel: please consider sending us a description of your favorite mementos from your students. Attach a picture, if you can. May 31, 2012. Uncategorized. 1 comment. Do these words sound familiar? Why is it that in spite of teachers’ best efforts to build a harmonious community, it doesn’t always happen? While all the above strategies are critical for building a community, we find that teachers often do subtle things that defeat all their hard work and have the effect of dividing the community. These messages communicate how the teacher is frustrated and tired of this student. The implication is that the student is the problem not the behavior! It conveys a message to this particular student that he is not accepted, that he is defective. These comments have the effect of ostracizing the student from the rest of the class and it gives the other students permission to not accept that student as part of the community. It is understandable that teachers get frustrated and tired, after all we are human. If we want to create a classroom community for all students, however, then in addition to doing all those positive proactive strategies, we must also make sure we preserve the dignity of the student whose behavior might wear us out. We must respond to behaviors respectfully and continually send a message that it is the behavior that is the problem not the child. If we can manage our own feelings and treat ALL of our students with respect, especially those who may not reciprocate, then we can truly create a classroom community, a unique environment where EVERYONE feels that they belong and that they matter. May 1, 2012. Uncategorized. 2 comments.